PEA and asystole. Family reported a recent diagnosis of lung cancer. What is the likely etiology of this patient’s cardiovascular collapse? Asphyxiation rather than exsanguination is the most likely cause of cardiovascular collapse in massive hemoptysis. 90% of cases of massive hemoptysis are caused by bleeding in the bronchial circulation, which is exposed to systemic pressures; bleeding in the low pressure pulmonary circulation accounts for only 5% of cases. What is the likely etiology of the hemoptysis? The list of possible causes of massive hemoptysis is extraordinarily large, and includes many rare conditions. 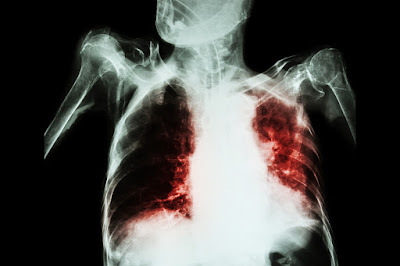 The most common causes are bronchiectasis (often due to TB or cystic fibrosis), lung cancer, and pneumonia. TB is a common cause in endemic areas, but less common in the developed world. Other etiologies include infectious causes e.g., fungal infections, necrotizing pneumonia, and parasitic infections; alveolar hemorrhage; vascular disorders such as AVMs, PEs, or aneurysms; trauma; iatrogenic causes; and inflammatory conditions such as Wegner’s or Lupus. What is the initial treatment for massive hemoptysis? What aspect of the treatment was non-ideal in this case? Pulses return and the airway is temporarily managed, what now? Chest X-Ray or Chest CT. CXR should be obtained as soon as possible, as it may help identify the side of bleeding (although 20%-46% of the time it won’t be helpful) and in some cases may help identify the cause of bleeding, e.g., if there is a visible mass or cavitary lesion. CT is superior to CXR in identifying site of bleeding and superior to bronchoscopy in identifying the etiology of the bleeding, but is only suitable for patients stable enough for transport out of the department. CT may also help plan for possible angiographic intervention, and CT with contrast can help identify AVMs or aneurysms. The initial priority is resuscitation, and blood type should be obtained with subsequent cross matching of several units of blood (one source recommends an empiric 6 units). Other labs should be obtained including coagulation studies, CMP (uremia can cause platelet dysfunction and may require platelet transfusion), CBC, possibly sputum, and a UA (blood may suggest Goodpasture’s). Unfortunately, this patient never did regain a pulse and remained in PEA or asystole throughout the attempted resuscitation. CPR had been ongoing in the field for approximately 30 minutes prior to arrival; bag valve mask ventilation and subsequently ventilation after intubation had been difficult. CPR was discontinued and the patient was declared dead. 3. Wong BK. Hemoptysis – Massive or not. Proceedings of UCLA Healthcare. 2014;(18). 4. Sakkour A, Susanto I. Airway management in massive hemoptysis. Emerg. Med. and Crit. Care Review. 2006: 45-46. 7. Jean-Baptiste E. Management of hemoptysis in the emergency department. Hospitl Physcian. January 2005:53-59. Journal Club: Steroids for Everything?